I'm very excited about this project, I've downloaded it and started using it but unfortunately it keeps crashing all the time. I work on Win 10 with latest Java Software. Do you have any suggestions? I am not as knowledgable as other staff members for this sort of thing, so may be of limited use. But it would help if you could supply more details. Did you ever get NodeBox to run? Does it crash every time you launch the app, or only when you try to open a certain ndbx file? What version of NodeBox are you using? The more details you supply, the better the odds someone can help you. I am using the latest version of Nodebox. etc. But especially for shape nodes such as rectangle or circle it crashes. because I think it is one of its kind on Win I guess;). The things you describe seem perfectly normal so I don't understand why you would be getting errors. Are you able to repeat actions that generate these crashes? Would it be possible for you to save a ndbx file from just before your crash and then describe what attempted node addition or connection triggered the crash? You could then attach that file to your next reply so that we could try to replicate it. NodeBox is indeed one of a kind (on Win or Mac). I hope we can help you get it working. 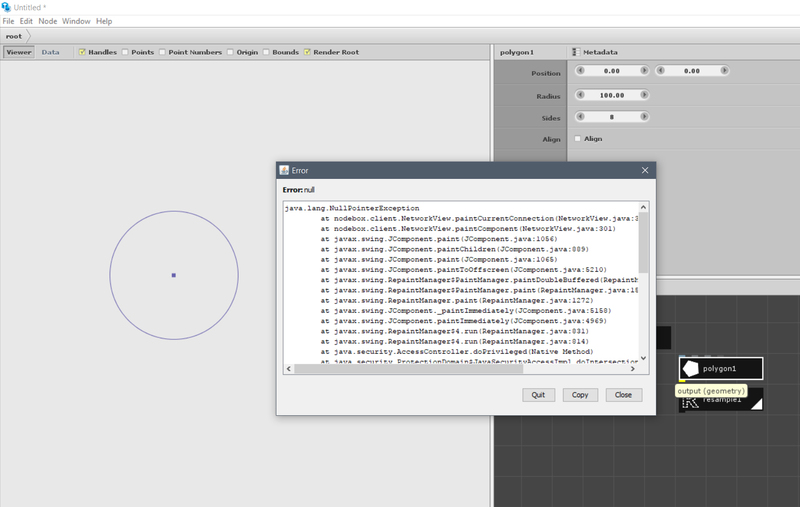 Then I restarted program again with simple geometry nodes such as line and polygon I tried to connect resample node. Then it crashed again. I ran windows program troubleshooting (program compatibility when downgraded software to work with win 8 settings. I also checked run program administrator option. I updated Java to its latest version. By the way for your questions I cannot because I don't know when it will crash. Sometimes I work for 20 minutes sometimes it last 1 minute:) It does not happen on same operations but generally speaking it crashes when I play with geometry nodes. When you say "crash" do you mean that NodeBox closes or freezes, requiring you to do a forced quit? Or do you mean that you see an error dialog that can then be dismissed (as seen in your screenshot)? I presume the former - but just checking. One thing to check is that you don't have nodes on top of each other. Drag nodes around to make sure nothing is underneath. If you connect a node to an inappropriate port, you can sometimes get a Null error (similar to one you show in your screenshot). But that shouldn't crash NodeBox. I tried replicating some of things you described and experienced no difficulties, so I am stumped. NodeBox should not crash and almost never does for me (I'm now using a Mac but it worked well when I was using a PC). Perhaps there is something funky about your Windows 10 environment (though it sounds like you've already tried the most obvious things). Unless you can demonstrate a series of actions that reliably triggers a crash and send a ndbx file just before that crash it may be hard for us to help. I do not have access to a Win 10 machine. Frederick, do you have any other suggestions? Is this in the latest version of NodeBox? There were some issues with previous version but as I recall they were all fixed. Since this happens in the network view, this is probably the result of some action you took: dragging nodes, connecting/disconnecting, creating new nodes,... Do you have some hunch on exactly after which operation this occurs?